This page covers download retail costs after audio production. This is how to cost your own music downloads and how retailers cost theirs. The CD costs page gives a detailed breakdown of recorded music component costs and prices. Pricing downloads isn’t the same as pricing CDs. With CDs you need to recover costs that occur before the sale (e.g. CDs, packing material, stamps). With downloads more costs can be covered by digital music aggregators or online payment services, and you aren’t buying any stock. Also, a mail order CD could reasonably sell anywhere between £2.50 and £15 but the going rate for a download track is normally between 50p and £1. It’s hard to make a case for selling music downloads from your own site these days. The tools are there (Payloadz provides a partly bundled solution) and it’s possible to do it, but an aggregator will bundle all these costs for you and get your downloads onto the main music retail sites. Annual credit card payment gateway fee, etc. Some one-off costs and running costs might be paid out of writer, artist, label or publisher income. This page assumes the artist is also the performer—otherwise allow for session payments or points for collaborators. If you use a music download aggregator your online retail costs are covered. So if you use a download aggregator the tax issues are different from selling your own CDs. You may also want to join the collection societies for your share of JOL and PPL income. If you sell your own downloads the price you charge is up to you but be sure your tax is covered. At 79p/track you’d need to pay the VAT on about 76,000 tracks a year (if you sell them from your own site) so keep 17.5% safe unless you’re certain you won’t sell that many. Your income should also cover some general one-off and running costs, and if you don’t have evidence for that it’ll become taxable as income too (I allowed 10% on the CD costs page). Recording owners 51p to share with artists etc. Web site 23p covers VAT, JOL, etc. 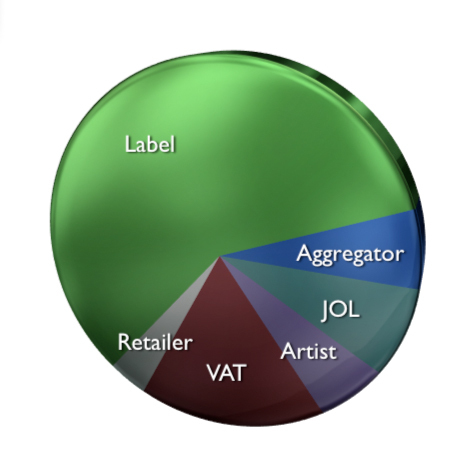 These breakdowns are based on published aggregator fees, reported artist earnings and fixed costs (JOL, VAT). There is no standard or average, and big label discounts apply in a similar way to CDs. 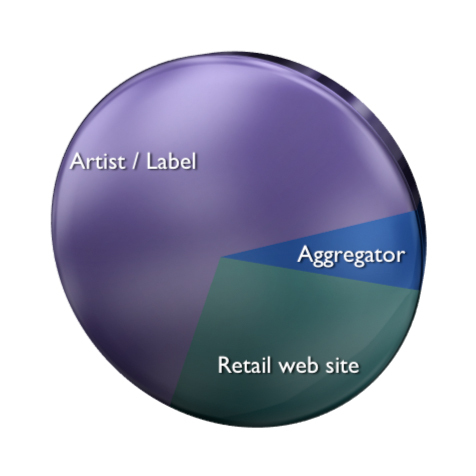 Big labels also pay considerable sums for promoting their releases on download retail sites.